Fortunately, I’ve learned that the shortest route to an attitude adjustment has to be ice cream. Take a crying kid and give her an ice cream cone and those tears quickly dissipate into a dirty-faced smile. Take a curmudgeony grown-up on a hot, sticky day out for gelato and they’re bound to relax. So last week I decided to take my bad mood out for some ice cream. Inspiration wasn’t too far off. As I was snapping pictures at the Hollywood Farmers’ market for my monthly contribution to Serious Eats’ Market Scene (which, incidentally, was about June Gloom too—there seems to be a theme here), I tried gorgeous tangy-sweet blueberries from Jimenez Family Farm, newcomers to the market. The navy blue orbs were like nature’s Pop Rocks, exploding with flavor that was surprising for this early in the season. Armed with blueberries, I wandered over to Lily’s herb stand and, sniffing around, discovered some lemon verbena. An herb native to South America, it has powerful lemony scent with just a hint of grassy undertones. It’s a nice complement to fruit salad, makes for a refreshing tisane and, I thought, would add a nice lemon quality to the ice cream without adding more acidity. When I told Lily what I was thinking she raised her dark eyebrows skeptically. The combination of the fruit and the herb was the delightful, summery remedy I was looking for. 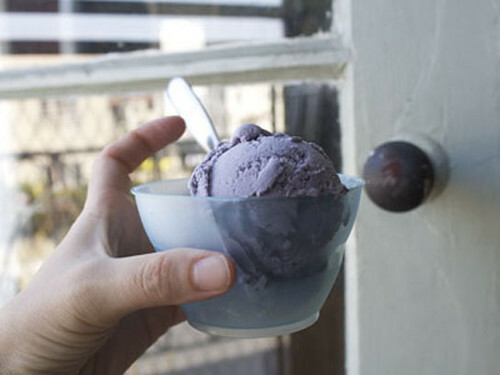 And it’s cerulean color, tinged with purple, and its creamy richness would have to suffice for blue skies, at least until July. Stir together the blueberries, a pinch of salt and sugar in a medium saucepan over medium-low heat until the berries start to give up their liquid. Add sprigs of lemon verbena and let steep for about 45 minutes. Remove the lemon verbena and puree in a blender until smooth. Pour the blueberry mixture through a sieve to remove seeds and skins, then add back to the pot and stir in the milk over medium-low heat. Pour the heavy cream into a medium bowl and set a strainer over it. Set aside. In another medium bowl whisk your egg yolks until they’re smooth. Slowly pour the warmed blueberry mixture into the eggs, mixing constantly, to temper the yolks. (Do this too fast and you’ll end up with blueberry scrambled eggs.) Transfer the blueberry custard base back into your pot and heat again over medium-low until the mixture thickens slightly. You’ll know it’s ready when you can drag your finger through the batter on the back of a spoon or spatula and it doesn’t run together. Pour batter through the strainer into the cream. Stir to combine, cover with plastic and chill overnight. Freeze according to your ice cream maker’s instructions. This is brilliant Leah – can’t wait to try!! We’ve had months of rain here as well, so I feel your pain. 😉 Market inspiration for this lovely recipe appears a gracious cure. What a beautiful ice cream and a inventive use for one of my favorite herbs. If only my farmers market has some, but now I’m extra motivated to keep asking after it! Just made cinnamon ice cream today. I can’t make it often, as I could polish off the whole batch if no one is around. I love the flavors you have here, so lovely !